Even though Google Home has been on-sale in Australia since last year, it wasn’t the first smart speaker announced – instead that honour goes to the Amazon Echo, a speaker powered by Amazon’s virtual assistant: Alexa. The shopping giant entered the Australian market with more of a whimper than a splash last year, but the Amazon Echo line didn’t make it here until February, when they launched with the Echo Dot, the equivalent of the Google Home Mini, the Echo, essentially their standard model and the Echo Plus – a version of the Echo with a Zigbee hub built-in that lets you control all your smart home goodies that require the Zigbee protocol. Pricing is pretty good for a smart speaker, with an Amazon Echo costing $149, that’s $50 less than the RRP for Google Home if you’re wondering. Amazon also has a habit of discounting these regularly, so you can find a good deal if you’re willing to wait. 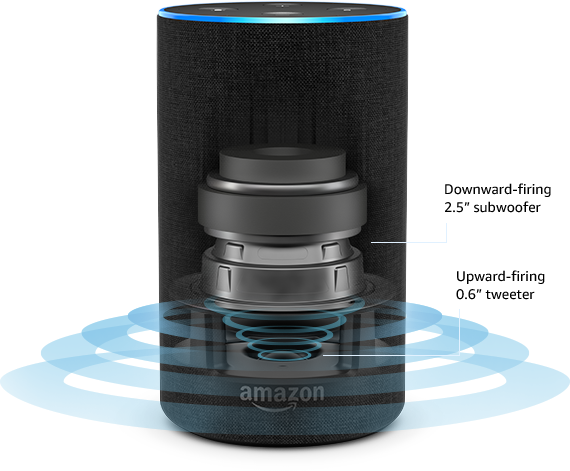 Now on their second generation of hardware, Amazon has had time to refine the Echo hardware taking in feedback from users, tech reviewers and also from their supply chain to build something better this time around. First generation products are generally prone to issues, and given Amazon has delivered the 2nd gen Echo instead of the first complete with a rich eco-system of skills and partners, having to wait for the Echo to land here in its 2nd generation is definitely a positive. Amazon has a big share of the smart speaker market, and with their hold over shopping in the US, it’s been posited that it’s an unassailable lead. 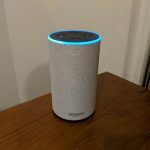 Their library of third-party ‘Skills’ (the equivalent of Google’s Assistant apps) is vast, and it seems that it’s Amazon’s race to lose when it comes to the smart speaker market – so should you buy an Amazon Echo? Let’s find out. I’m going to come out and say it straight off the bat – I prefer the look of the Amazon Echo to the Google Home. It’s a simple, yet elegant cylinder that comes in three colour options: Charcoal, Sandstone and Heather fabrics. The Echo is a fairly tall unit at 148mm and it’s 88mm in diameter. This tall cylinder contains a 2.5″ woofer and a 0.6″ tweeter. At the base of the echo you’ll find a power input, and next to it a 3.5mm adapter for connecting to other speaker systems. It’s output only, so you can’t just plug a source in and have it play through the speaker. Also inside the Echo are seven microphones, which Amazon says utilises ‘beam-forming technology and noise cancellation’ which basically means that the Echo can hear you when you call Alexa from anywhere in the room, even while the music is playing. The microphones are hidden behind seven holes in the top which is where you find the physical controls for the Echo. Where Google has gone for a capacitive touch interface with LEDs, Amazon has gone for physical buttons on the top. 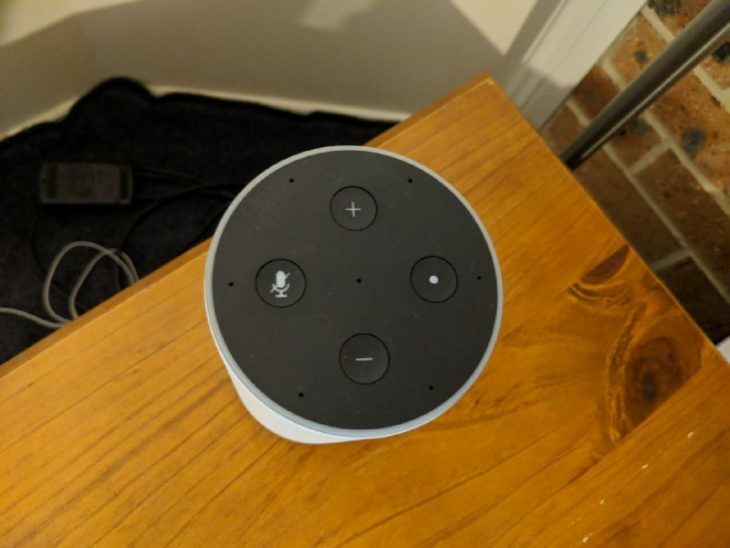 Four buttons cut a cross through the top of the Echo, Volume up and down above each other, with a mute or privacy button to the left, and an activation button to call Alexa without actually saying ‘Alexa’ on the right. Surrounding the top of the Echo is a ring of multi-coloured LEDs. The LEDs light up depending on what Alexa is doing, a pleasant Blue colour appears when Alexa is called, while the ring lights up a pinkish/red when the privacy mode is on. One down side to the Amazon Echo design isn’t the design itself, but availability of the ‘Shells’ that Amazon sells to give the Echo new looks. In the US there are a number of designs including Walnut, Oak and other fabric designs – in Australia though, we don’t have that option. It’s not the end of the world, but it’d be nice to have the option. The Echo can really pump out the audio when it wants to, but the quality of sound is relative to the price point. It’s essentially a $150 speaker and it sounds like it. The bass on the 2.5” woofer is fairly unimpressive once you ramp up your tunes to top volume, and the small tweeter tends to struggle also. At lower volumes though, the Echo performs really well, with a clean, even sound. The Echo also supports multi-room audio, so if you have a number of Alexa enabled speakers or Echo units around you can pair them up for a multl-room audio experience. Amazon has also enabled your Echo speakers to pair with Bluetooth speakers, so you can also include these speakers in your multi-room setup. Multi-room audio with both Amazon and other Alexa enabled speakers is a big plus when you’re having a party for background music, or even just cleaning the house. Multi-room allows you to simply turn on your tunes and go. In terms of the ability to pick up your voice, the Echo is brilliant. The beam forming technology utilised by Amazon is stunningly good, with the Echo responding even when the music is playing quite loudly, or with background noise from the TV or kids hampering efforts. Alexa is a pretty decent wake word, but you can, if you want change it to something else. A handy option if someone in your household is actually named Alexa, or Alex. Amazon has their own music service, Amazon Music, which the Echo can tap into quite easily, but you can also select to play music from other sources including Spotify, iHeartRadio or even TuneIn. What it doesn’t support is other offerings such as Google Play Music, Apple Music or Tidal. It’s become apparent that smart speakers are definitely a way for companies to capture you into their eco-system as Google and Apple are equally guilty of not offering each others music service on their speakers, as Amazon is. Amazon does include their Amazon Music streaming service as part of their Amazon Prime service, but Amazon Prime isn’t yet available here in Australia so until it is, and you decide to use it you’ll have to pay the $4.99 per month for just Echo devices, or $11.99 per month fee for all devices to get access. The sole vendor to stand out for music streaming is Spotify, so making Spotify your music streaming service of choice is very much becoming a good option if you’re prone to investigating new technology. The voice that Amazon has used for Alexa – a female voice – is very natural sounding. I’ve found that after using Google Home/Assistant after using Alexa to be a very eye opening experience due to the stilted, robotic nature of Google’s Assistant voice. Amazon had a bit of fun with the concept of Alexa losing her voice at the superbowl this year, but for me it’s a little bit more natural sounding and it does make a difference. 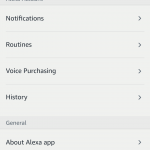 The key to the entire Amazon Alexa experience is the Alexa app which is available on Google Play. 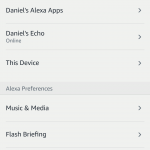 You’ll need this app to setup and configure your Echo device, and then configure it for all the features, set defaults and setup routines or find Smart Home devices. 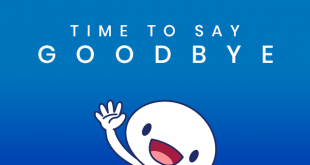 The app is extremely easy to use, and well laid out. 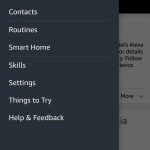 The home screen has all the basics to tell you what’s going on with your Echo, including a What’s new section at the top to show you new things to try with Alexa to get more use out of it. There’s three main screens – Home, Calling and Messaging (yep, you can call other Alexa devices or users) and the Music screen. 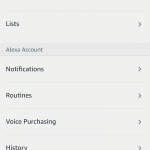 The app then has a slide out menu from the left that lets you access all the services connected to Alexa, or you can jump into the Settings sub-menu to access even more. 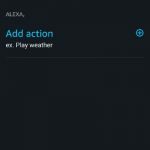 The basics of Amazon Alexa is setting alarms and reminders, as well as getting the weather and traffic work really well. Amazon does have a lot of work to do with their basic searches though, with a lot of searches failing. Given I use voice assistants for a lot of searches this is a big problem and one I hope Amazon can resolve in the future. Amazon has one big failing in that you can’t really order stuff from them as yet. Hopefully this can be resolved down the track when they launch Amazon Prime later this year (we hear around June/July), but you can add a heap of stuff in to lists which is handy. 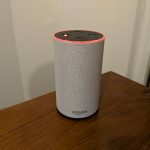 There’s also the issue of multiple users or multiple voices – I couldn’t get Amazon to add my wife or sons voiceprint to Alexa so this is a bit of a let down. 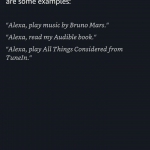 Amazon has built a good range of services and commands into Alexa, but they’ve also allowed third party developers to integrate their own services into the Amazon Echo eco-system using ‘Skils’. If you’ve used Google Assistant Apps you’ll be familiar with these. 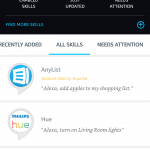 With a couple of years lead on Google Home and their Assistant apps, Amazon has a large a lead on the amount of skills available to users. 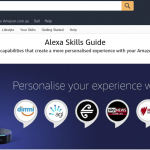 When they launched here in Australia, they had over 10,000 skills including a huge amount of Australian businesses who launched their Alexa skills at that time – and more are coming on board every day. 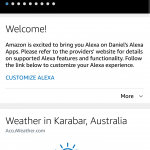 You can find Amazon Alexa Skills in the Alexa app, or you can check out the web directory. Either way is easy, but the web interface seemed to be a bit easier for searching, just sign into your Amazon account, then search. Both the web interface and the app have a list of your Skills you have attached to your account, though the app does make it easier to see if there’s any issues to address with your Skills – like logging into them for one. One of the big leads that show on Alexa over Google Home/Assistant is that businesses launching Alexa Skills have access to their payments API, so you’ll find yourself being able to say order a pizza using the Dominos Alexa Skill, something you can’t do (yet, but soon will be able to) on Google Home. There are still limitations on Skills, notably they’re geo-restrictions so Australians are used to some of those. 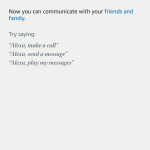 Broadlink and Dialpad are two notable ones, but as these are third party skills, it’s up to the company to add them. 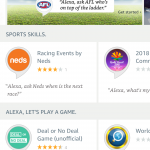 One exciting recent addition was Plex made their Alexa skill available in Australia – so that’s a win. 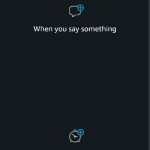 Flash Briefings – basically podcasts from news partners – are also an interesting feature of Alexa. You can have them attached to routines (we’ll get to those next) or you can just play them by themselves. There’s international Flash Briefings from notable news sources like CNN, or local ones from Ten News, the ABC and SBS to name a few. If you’re a Google Home user, you’ll probably be aware of the ‘Hey Google, Tell me about my day’ command that links together a summary of your day including a look at your calendar (yes it can connect to Google Calendar), tell you about the weather, what the traffic is like on your way to work and then finishes with a podcast of news from sources you pick. This is a routine, albeit one you can’t really change a lot. 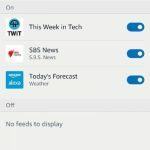 Routines on Google Home aren’t available in Australia yet – but they are on Amazon’s Alexa, and they’re awesome. 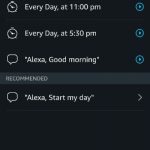 Through the Alexa app on your phone or tablet, you can tell Alexa to setup a new routine based on a voice command ‘Alexa, I’m home’, ‘Alexa, Good morning/night’ and then set up a range of subsequent activities involving Smart Home, things Alexa Says, News, Weather, Traffic, Music and even volume controls that are triggered. 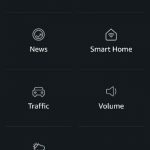 I had fun adding in routines, automating some of the smart home devices in my home including turning on my electric blanket, turning on/off lights, setting playlists to playing and turning my smart lights on at specific times – I know I can do this in the apps, but it’s more convenient to have it all in one place, especially when dealing with a number of different types of lights. Amazon’s Routines are limited of course to Amazon’s eco-system and third party skills, so notably I can’t get my Chromecast playing, which of course means I’m now looking to buy a Firestick – you win Amazon. Using an Amazon Echo for a few months has been a real eye opener. It shows how far Google has to go to catch up in some areas, and how far ahead they are in others. There’s also the price, with Amazon holding frequent sales on the hardware it makes it easy and cheap to expand your collection of Alexa smart home devices. One big change coming for Amazon is the Amazon Prime service that’s apparently coming later this year. For one low price you get a great amount of benefit including things like Amazon Video and Music services, free Kindle books, Twitch Prime streaming, and included 2-day shipping to most places and possibly more – we’ll know more when they launch. 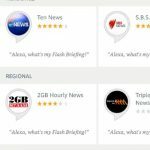 Once they launch Amazon Prime, Amazon could be a no-brainer for the average Australian when it comes to choosing which Voice Assistant they want to use. That said, at the moment there are a lot of barriers for use unless you use Amazon services like Amazon Video and have a Fire TV – or choose to use Spotify for music. I find I use the Amazon Echo a lot, but still default back to Google Home for searching and streaming music and video. That said, the more Amazon brings to Australia, the more I’m going to find it harder to continue using Google Home. The Amazon Echo is currently $149 from Amazon Australia. You can check it out on their website here.